Editor’s note: This column has numerous photographs. Click here to see them. We moved to Virginia in 1987. In case that’s just a number to you, let me tell you what was going on in that year. No smoking rules were just starting to take effect inside public buildings. (Here in Virginia, it was not uncommon to be waited on in a store and have the clerk blow smoke in your face.) It would be another fifteen years or so before non-smoking laws started taking effect in restaurants. Because of its love affair with tobacco, Virginia was one of the last states to adopt no-smoking laws. The Fox TV network began, with its first show being “Married With Children.” We watched that show for years. (This shows how culturally discerning Fluffy and I are.) The best of Fox TV’s shows, “The X-Files,” wouldn’t even begin running for another six years. Michael Jackson tried to buy the Elephant Man’s remains. I have no comments about that incident, not being a Michael Jackson fan or a particular follower of the Elephant Man. The first salvaging of the Titanic wreckage was begun by RMS Titanic, Inc. Fluffy and I have been to the burial ground for the bodies that were brought up from the Titanic. The graves were arranged in the shape of the hull of a ship on a hillside in Halifax, Nova Scotia. There is a Marriott buried there, but he isn’t related to the hotel Marriotts. I asked Mr. Bill Marriott himself. “Star Trek: The Next Generation” premiered. I remember that night. Fluffy and I were in a dingy New York hotel for that one, but we got reception on our television and were able to see Captain Picard in all his glory. What a hunk! The day of infamy for our generation, 9/11, was still 14 years into the future. Yes, friends and neighbors, 1987 was a long, long time ago. In fact, a whole bunch of the people reading this column were probably not even hatched when Fluffy and I moved to Virginia. We have lived in Virginia for 27 years this year. 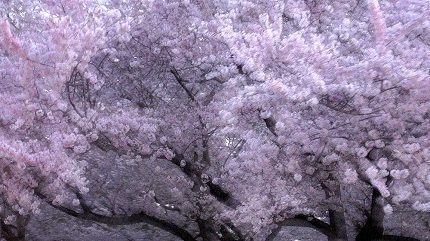 That is 27 years of glorious Virginia springs — 27 years of dogwoods and redbuds and, well, cherry blossoms. And therein lies the rub. We live within spitting distance of the White House (oh boy, is that appropriate these days! ), at 24.3 miles according to Google Maps. We have many, many friends who commute into Washington, D.C. (referred to around here as “The District”) every day for work. People around here don’t even think twice about driving into the nation’s capital. So in twenty-seven years of glorious East Coast springs, how many times do you suppose Fluffy and I have gone to see the cherry blossoms bloom in Washington, D.C. — just 24.3 miles from our doorstep? That’s a big goose egg, friends and neighbors. Zip. Zero. Nada. 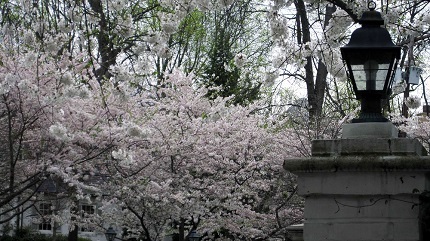 This is particularly noxious because I have wanted to see the cherry blossoms. Oh yes. 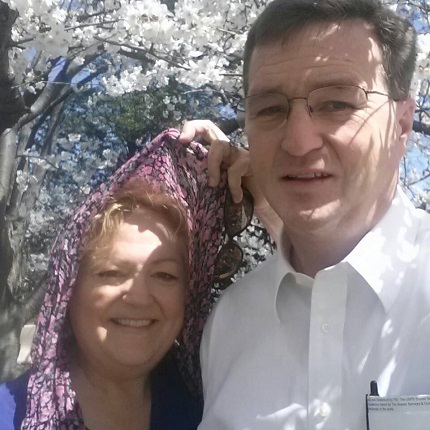 In fact, I have a dear friend in Utah who has planned for years to fly all the way to Virginia to have Fluffy and me show her the cherry blossoms, but she keeps finding herself in China or Peru during cherry blossom season, so she hasn’t been able to time a visit at when the cherry blossoms have been blooming. Every time Dian has told me she was going to be at Machu Picchu or climbing the Great Wall instead of coming to our house during cherry blossom season, I have heaved a sigh of relief. I, you see, have had no earthly idea how to show her the cherry blossoms, because I have never been there. It has been the bane of my existence — or one of them, at any rate. Saturday before last, a friend of ours, Jeff Stolk, called at about dusk and said he was available for fun and frolic that night. He knew that Fluffy and I had been cooking all day, and he no doubt hoped that fun and frolic would include some tomato tortellini soup and a game or two of pinochle. But no, he had not counted on the brazen Kathy, Queen of the Universe, She Who Will Not Be Denied. There was dead silence at the other end of the line. Finally he said, hesitantly, “Yes, I guess it would.” It was only after we were halfway into the District that we learned this was Jeff’s fourth trip into the District to see the cherry blossoms this week. But we were on our way. Our friends Jeff and Maura Stolk. If Jeff looks somewhat weary, it’s because he went to see the cherry blossoms four times in one week. He was probably cherry blossomed out long before he took Fluffy and me on that Saturday night. I had been told by one of the temple workers that nobody goes to see the cherry blossoms after dark, so that would be a good time to go. All I can say about that is that it is not nice to lie in the temple. There were only about 50,000 other people who had the same brilliant idea. But we did eventually find a parking spot, and the two men got out of the car to take pictures while I stayed behind and enjoyed the crush of humanity and the nighttime breeze. 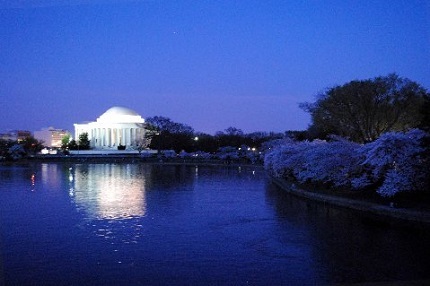 The Jefferson Memorial at dusk, with cherry trees on the right. 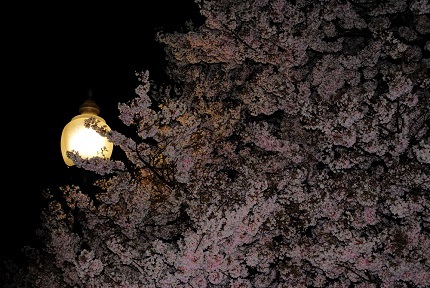 The pale pink cherry blossoms are illuminated by a street lamp. Only the magic of PhotoShop saves a picture that I took from a moving car, but this is a good illustration of how many blossoms there were. They were everywhere. Jeff was such a good sport and we had such a grand time seeing the cherry blossoms that Fluffy and I decided to take our temple worker friend’s advice and see the cherry blossoms a second time on Monday. This excursion took us to the Kenwood neighborhood in Maryland, a small neighborhood that received its own cherry tree plantings when the Tidal Basin in the District did. 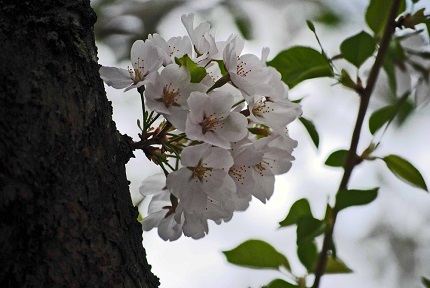 Relatively few people know about the Kenwood cherry trees, but there were enough of them that the Kenwood neighborhood was festooned with temporary “No Parking” signs and signs commanding interlopers not to climb on the trees. Scores of tourists, many of them Japanese, wandered up and down the streets of the community. Fluffy parked me in a wonderful spot, and he went off to take pictures while I remained stationary to take photographs of my own. Monday was probably the last good cherry blossom day before a huge rainstorm on Tuesday wiped everything out, so it was raining cherry blossoms, and there were cherry blossom puddles on the sidewalks and in the streets. 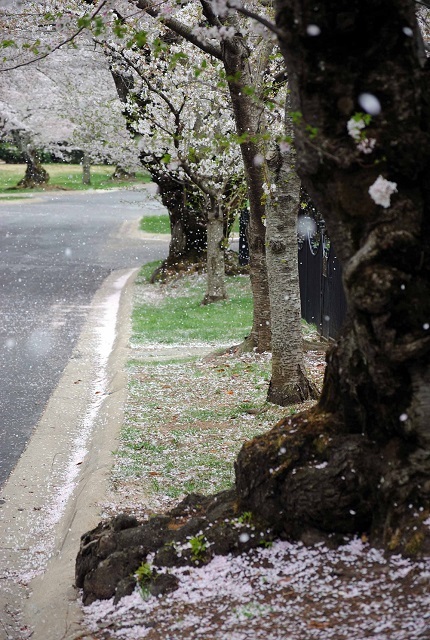 The slightest gust of wind caused a cherry blossom petal snowstorm. 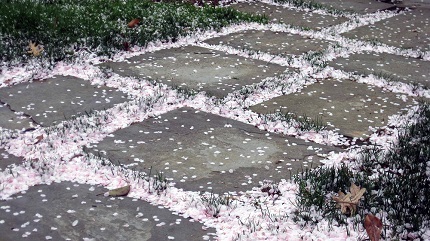 Petal puddles pooled on sidewalks and in streets. This gate with matching lanterns made a picturesque place for me to sit while Fluffy wandered. I never got tired of looking at the scenery and sticking my camera out the window on the side or up top to take a picture or two. Every tree was covered with thousands of sprigs, just like this one. If they only produced cherries, all of the D.C. area would be in for a cherry feast. As we drove off to finish our adventure in a Mexican restaurant, Fluffy and I marveled that we had lived in this area for so many years and had never taken advantage of such a glorious opportunity. But that’s the way people are. God has given us an amazing world, full of blessings that are ours to take. But how many of them do we actually take advantage of? Children are so good at exploring the world around them. They dig in the dirt for bugs. They walk in the rain. They jump in the puddles, and they pull everything out from the closets or the cabinets. They want to discover everything. When we get older, we tend to get complacent. We tend to get caught in our routines, and we forget to explore. We forget that there are blessings right under our noses. All we have to do is to open our eyes, and to look. Just this week, Fluffy found a box in a closet upstairs. A friend of ours had found a whole bunch of family pictures — my family pictures — all over the upstairs of our house when she was designing my office, and she had put it in a box that she plainly labeled “Family Pictures.” I had never even looked through the box. Fluffy brought the box downstairs two days ago, and we have been going through it ever since. What a treasure trove it is! It has pictures of my mother I have never seen. 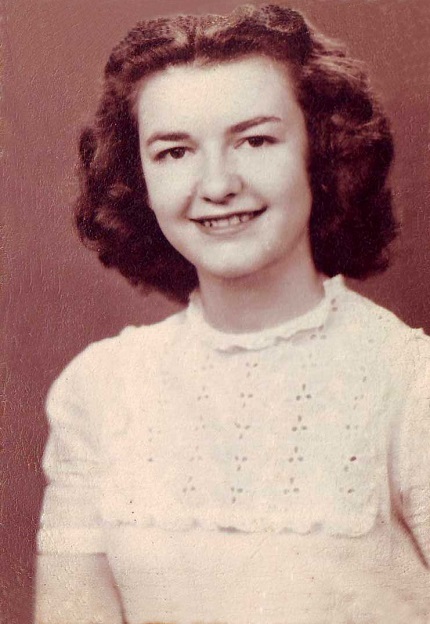 My mother died in 1970 and never allowed her picture to be taken as long as I could remember, so pictures of her are rare treasures. This picture of my mother as a teenager has been in my possession for decades, but I never saw it until two days ago because I never went through a box of old family photographs. The recent experiences with cherry blossoms and with old family pictures have shown me that we are surrounded by blessings that are ours, if we will only stop to take advantage of them. God showers us with gifts every day, but we are so busy with our lives that we often don’t even see them. We ignore them as Fluffy and I did with the cherry blossoms, or figuratively put them in a box and shove them in a closet, the way I did with my treasured family photographs and genealogy. What gifts has God given me that I have yet to discover? What treasures has God given you that are yet to be unwrapped and appreciated? Look around you. You may be surprised and gratified at the presents that are right underneath your nose, ready to be opened and savored, and to show you how much He loves you.